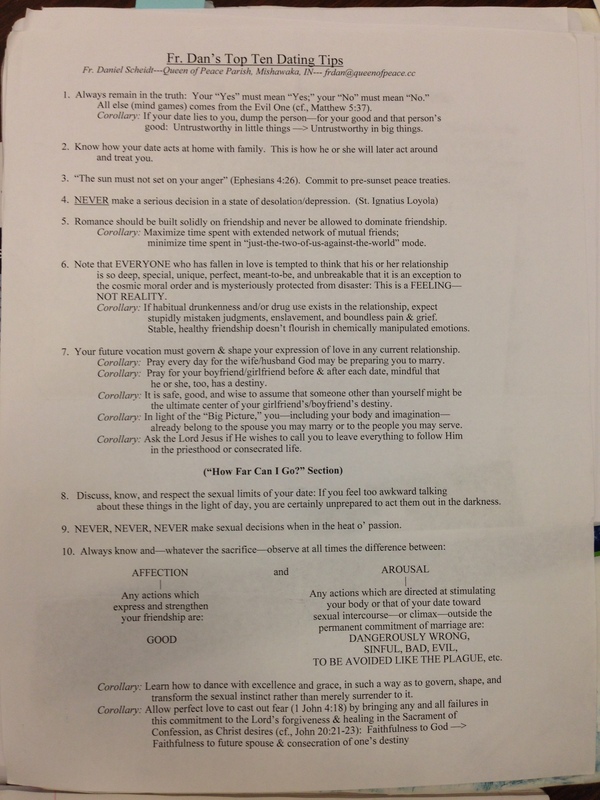 Here’s a really useful tip sheet for dating that one of my friend’s priests wrote up. I’ve had it for years but I only realized that it’s so good that I should share it with everyone else! I still consider myself a beginner at prayer, but I’ve actually had some great revelations in learning to pray over the past few months. It’s been awesome! So I’d like to share them with you, hopefully they can inspire and help you in your own prayer life! 1. Make prayer a habit. You won’t learn to do anything well unless you do it consistently, and this is especially true in prayer. Designate a special time for prayer every day, and stick to it. It must be a quiet place where you will not get easily distracted. 2. Be absolutely still. It is so easy for me to begin praying, and then find myself thinking about how I am uncomfortable, or staring at my hands, or doing something else other than praying. When I am still, I can focus without distractions. If I start playing with my thumbs, there is no way that I am also praying, I’m just not good at multitasking like that. 3. Focus on God and God alone. You should also speak with God about things going on in your life, but those things are things that you are bringing to God. If you begin thinking about these other things without God, it is very easy to transition from prayer to daydreaming. 5. You must have faith. Just as there would be no Church without Jesus, there is no prayer without faith. As awkward as it is, I often find myself “pretending” to pray. I think that it is a lack of faith on my part, a lack of trust that God actually hears me. And as soon as I realized that (praise God! ), I’ve been much better about asking God to help me have greater faith lately, and I have recognized how He has been much nearer to me. I notice this because I become so joyful at recognizing His presence and it’s as if I’m speaking with with Jesus right there next to me, “heart speaking unto heart,” as Bl. Cardinal Newman would say. 6. Be real with God. God knows what you really think anyways, so there is no need to hide what you think. Just as you’d talk with your best friend about everything that is going on in your life, it is even more important to speak with God about these things too. And it’s totally cool to complain to God, it’s biblical ;-)! And be real about your relationship with God. Ask His forgiveness for your sins. Ask for His grace to overcome them. Ask for His clarity when you are not sure what to do. Just as you can’t grow in a friendship with a friend when you aren’t yourself, you can’t grow closer to God when you aren’t yourself. And I’m sure that as you come to know Him better, you’ll have much less to complain about :-). 7. Adore God. Prayer is more than just speaking to Him. Just being with Him is enough, whether that is physically in mass or adoration, or spiritually in prayer. Prayer is also the desire of union with God, and that desire doesn’t have to be spoken to be real. 8. Use A.C.T.S. Prayer consists of Adoration- as I just spoke of, Contrition- asking for forgiveness for our sins, Thanksgiving- thanking God for His blessings, and Supplication- asking God for what we need. 9. If you are struggling, don’t give up. Praying isn’t something that always comes automatically. Sometimes it is easy, and sometimes it is hard. It’s a battle! I’m reading a book on St. Ignatius of Loyola’s Rule for the Discernment of Spirits, and it’s helping me recognize certain these things in prayer. Basically, prayer is more complicated than we make it out to be. There are good spirits that want to inspire and help us. There are evil spirits that seek to confront and disappoint us. We receive consolation and we should continue to grow in those times. We also undergo trial and dryness, and we should continue in those times just as in times of consolation, even though it is much harder. Spiritual advisers are great at helping you navigate through these difficulties. 10. Give yourself a significant amount of time to pray. You can only begin to to go deeper in prayer when you pray for a significant amount of time. Plus, if you set aside plenty of time, you will not have to be checking the time every other minute to make sure that you don’t miss your next event. 11. Pray throughout your day. It is essential to set aside a special time for deep prayer every day, but I also need to pray during the day so that I can remember to live for (and with!) Jesus in all that I do, especially when it is difficult. God often speaks to us through the situations that we encounter in our days. 12. 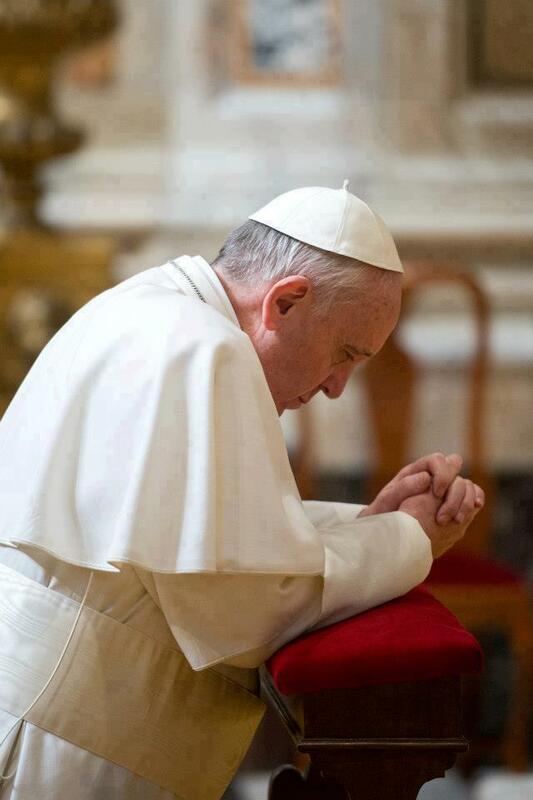 Do not skip contemplative prayer in favor of meditative prayer. If all of your prayer happens when you are at mass or while praying a rosary, you haven’t given yourself as much freedom to pray as you need. Both of those prayers are beautiful, but we need time alone with God to speak and to listen. 13. We must also listen in prayer. This is something that I still struggle with a lot. I know that Lectio Divina is a great way to combat this, because through the Scriptures, Jesus’ words are living and active, and they speak to our heart. So open up your bible and let Jesus’ words not only be to the other people in the bible, but to YOU. Another way to hear God is to see where He guides your thoughts and emotions during prayer. Sometimes our thoughts wander because we are being distracted, but if we pray well, the Spirit will move us to notice something that we never thought of before in our lives, and show us how we can better serve God. I think that I do my best listening in prayer by “listening” to how much that God loves me. This is very moving for me, because God reveals this to me in a relatively overwhelming way. It usually begins by me recognizing all that God has done for me, giving me life, faith, family and friends, opportunities to serve Him, and ultimately He died for me. 14. Pray when making decisions. When we have decisions to make, big or small, leaving God out of them is not going to help you in the long run. Ultimately, our life is about God, so why don’t we let Him into all corners of our life? When I pray and ask God what to do when making decisions, I ask Him to reveal to me what I should do clearly. Often this takes time, but I feel pretty confident that He speaks straight to my heart about what I should do. With some choices, there is one option that glorifies God more than another and I recognize that. I pray that I choose that option more. God speaks to me through my desires. I didn’t always think that I could be a FOCUS missionary, but I definitely always wanted to be one. Before it was too late, I recognized this fact, and recognized that it glorified God the most of all of my options for after college. God also gives us peace in our decisions when they is good. Sometimes a lack of peace is simply our conscience, and other times some decision just don’t seem to “fit” well with us. If you feel peace in a decision that you’ve been praying about, it is a good sign that God wants you to proceed in that direction. 15. Just do it. Every moment is an opportunity for prayer. There’s no time like the present. What are you waiting for? God’s waiting. Jesu so much in love with me? Your faith isn’t going to go anywhere..